Why install an air-tight woodburning or gas fireplace insert into my traditional open wood burning fireplace? Many older homes have traditional, built-on-location, open masonry (brick or stone) fireplaces. Burns wood very quickly: Open in the front, it allows vast quantities of air to be pulled into the fireplace. Oxygen feeds fire, causing the fuel to burn hot and fast. Provides minimal heat: The airflow entering the front of the fireplace draws the heat up the chimney, rather than heating the room. Requires diligent attention: Since the wood burns very quickly, it requires excessive refueling to keep the fire going. A new gas or wood burning Fireplace Insert fits into an existing open wood burning fireplace. Burns fuel slowly: Through the closed door, the air control regulates the quantity of oxygen reaching the flame. The fuel burns more slowly and efficiently. Provides significant heat: The system maximizes the quantity of heated air returning to the room, creating an efficient heat source. Requires minimal attention: Connected to a thermostat, a gas fireplace insert requires almost no attention at all. 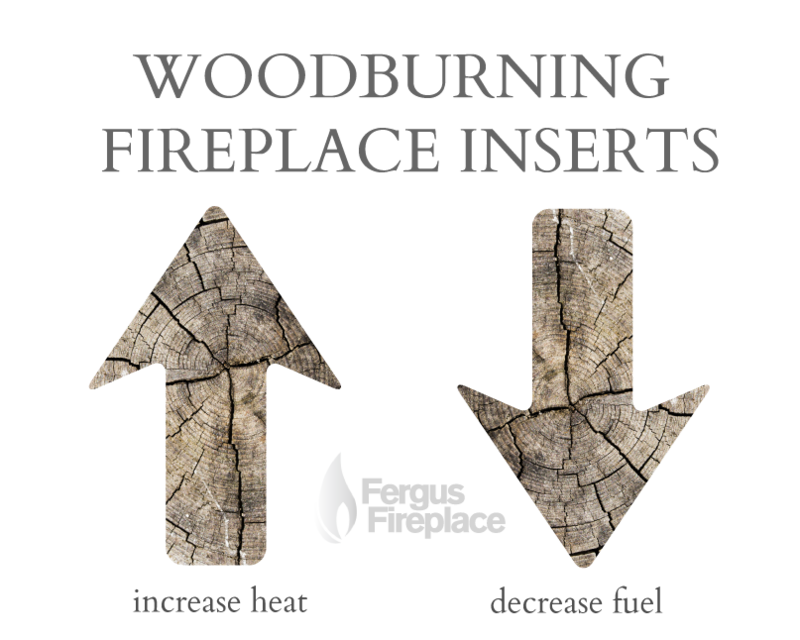 In a wood burning fireplace insert, wood burns very slowly, requiring less frequent refueling. An air-tight woodburning or gas fireplace insert increases heat and decreases fuel needs. Now that’s efficient!